We original designed Tidy Tree Trimming's website in 2003 and updated in late 2009. This site is hosted on our servers. We also host their primary and secondary DNS records. Our on going SEO services include monitoring their traffic with Google Analytics and making whatever minor changes are necessary to the page content to keep their site ranked well. We also manage Tidy Tree Trimming's back links. Tidy Tree Trimming is currently seeking back links from other tree service and landscaping companies from around the U.S. If you are interested in exchanging links with them, please visit our Link Exchange page. As you know, exchanging links benefits both of us by raising our search engine rankings and generating more traffic to both of our sites. Best of all it is FREE; there is no cost or hidden fee. We simply ask for a link back from a page of your site. Along with website development we also provide computer sales, service, network support, and network administration for their office which includes a Microsoft SBS 2003 server that handles their email. Tidy Tree Trimming is the best tree removal service in Phoenix, Scottsdale, Mesa, Tempe, Chandler, Glendale, and Peoria, Arizona. 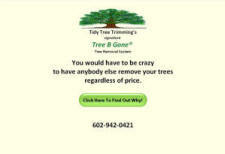 The Tree B Gone system is the most cost effective method of removing trees. "Terry with McGrath electronics was a client of mine almost ten years ago, I discovered he was an electronics engineer and specialized in Computer hardware and software for over twenty years, Wow, he must have worked with the old computers that used punch cards to program with. (Stone Age Caveman). I had used several computer â€œexpertsâ€ and was not getting good results with them. I consulted with Terry and was amazed with the process, he approached the problems with the most thorough insight (being a electronic engineer by trade) he has been my one and only IT tech and there is nothing he canâ€™t solve related to internet, web networks and building an online business with high search rankings and a working merchant account. My web site has ranked #1 on Google for the last two years with no pay-per-click or any other cost now how good is that. So I had Terry create another web site for my other business, and a very good job at that."